Hundreds of dead seabirds have been found washed ashore on sites from islands in the Bering Sea to villages north of the Bering Strait, signs of another large die-off in the warmed-up waters of the North Pacific Ocean. The dead birds are mostly northern fulmars and short-tailed shearwaters, species that migrate long distances to spend summers in waters off Alaska and other northern regions, the U.S. Fish and Wildlife Service reported. 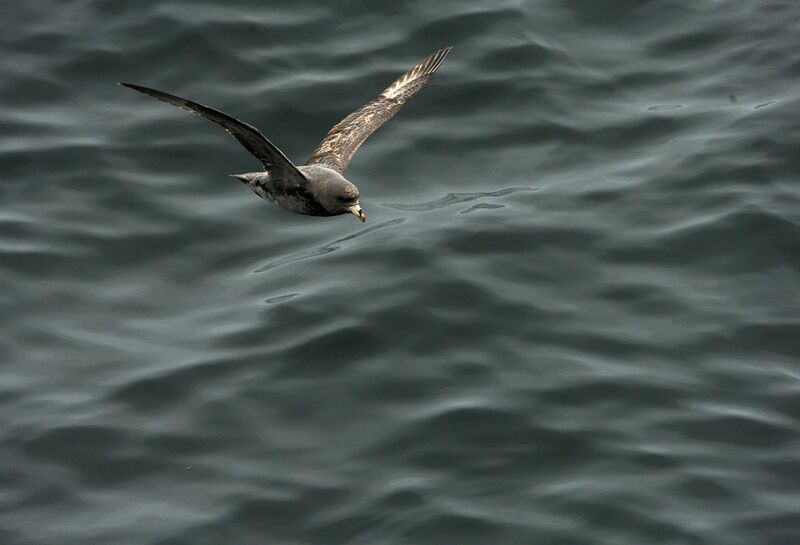 Also in the mix are some kittiwakes, murres and auklets, the federal agency said. The cause is being investigated. Necropsies so far show that the birds are emaciated — with no food in their stomachs or intestines and little or no fat on their bodies. The precise toll is unclear. 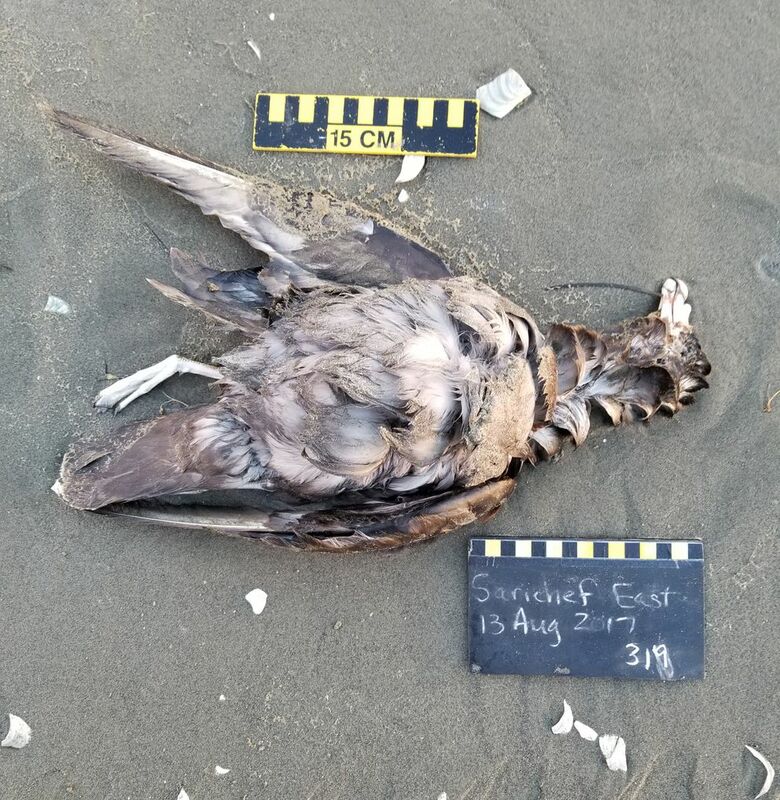 Fish and Wildlife said in its bulletin about 800 dead birds had been found since early August, but surveys are continuing and the known toll appears to be mounting — and experts caution that birds washing ashore represent only a small fraction of the dead. Of this latest wave, the first were found on the Pribilof Islands in the Bering, the Fish and Wildlife Service said. 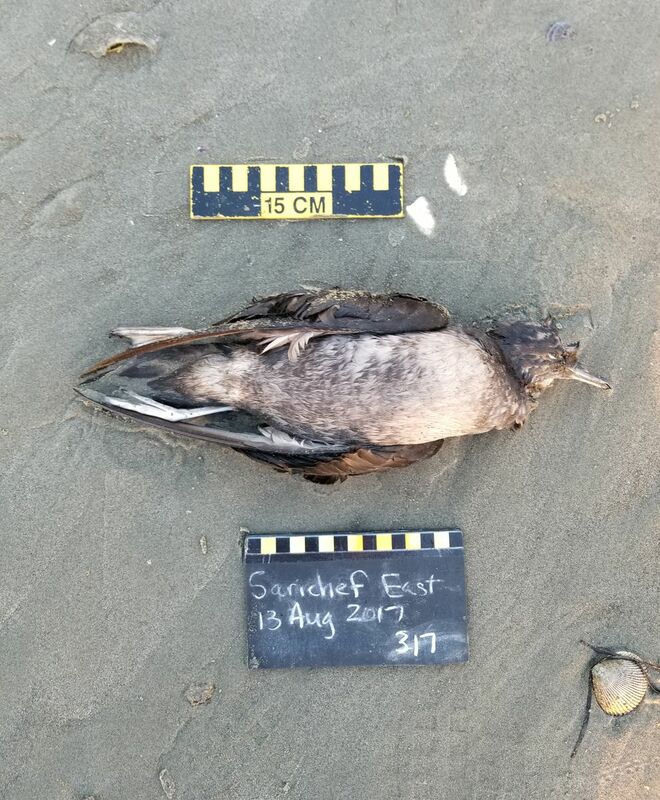 Since then, dead birds have washed ashore on Bering beaches and as far north as the Inupiat villages Shismaref and Deering on the Chukchi Sea mainland coastline. The new die-off follows a massive loss of common murres in 2015 and 2016, the biggest murre die-off on record in Alaska, and precursor to near-total reproductive failures for murres in the Gulf of Alaska and Bering. It also follows the deaths of hundred of puffins found last fall on St. Paul Island in the Pribilofs and, prior to that, mass deaths of murres and auklets along the U.S. West Coast. In each death wave, starving birds have left emaciated carcasses, and each wave has been associated with unusually warm marine waters. Stenek, who volunteers for COASST, said he and two other teachers found about 100 dead birds around Shishmaref. The carcasses appear to be more plentiful on St. Lawrence Island in the Strait. Surveyors have found about 500 dead birds near the St. Lawrence village of Gambell, Stenek said. He and his colleagues have found some birds alive but in very bad shape, he said. That is similar to reports from elsewhere, Parrish said. Birds found alive are "moribund" and being tossed around by the waves rolling ashore, she said. "They're kind of past the point of recovery," she said. "They're so weak they can't hold their heads up." "We know that they're starving. Their bodies are emaciated," said Robb Kaler, a biologist with Fish and Wildlife's migratory bird program. What is causing the starvation is unknown, he said. He had just packed up four additional fulmar carcasses Monday for express delivery to the Wisconsin center. "There's no sign of disease. We will continue to test for that," Kaler said. And investigations are continuing into possible links to toxins produced by harmful algal blooms, he said. The affected birds, northern fulmars and short-tailed shearwaters, "are different kinds of species than all the other die-offs that we have seen," she said. They are long-distance migratory fliers, with the shearwaters coming from as far away as Australia, unlike murres, puffins and auklets, which winter in North Pacific waters. The geographic scale of the current die-off is also remarkable, she said. The places where the birds have been found are very far apart, she said, which raises questions. "Are the birds that are dying throughout the entire ocean, or just within particular places? We have no way of knowing," she said. There are emerging reports that dead birds are washing ashore on the Russian side of the Bering and Chukchi, Stenek and Kaler said. But villages in the region are spread over vast distances, and there are no witnesses "if nobody's there to count the birds when the birds die," Kaler said. As with the bird die-offs, warm conditions are also suspected to be linked to recent marine mammal die-offs. Toxins from harmful algal blooms triggered by warm conditions are considered likely suspects in the deaths of dozens of large whales found beached or floating in the western Gulf from 2015 to 2016. Exactly what killed those whales has not yet been proven, however. That die-off has been classified by the National Oceanic and Atmospheric Administration as unusual mortality event, a designation that allows for special investigation.